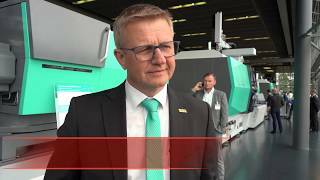 Well-known industry names featuring prominently on the exhibition floor include Borealis, Erema, Ettlinger, Gneuss, KraussMaffei Berstorff, Tomra Sorting Recycling, RPC-bpi Recycled Products, Suez, Veolia/Multiport and WIPA. The new Innosort Flakesorting system from Tomra Sorting Recycling (Stand E14) combines colour and material sorting through NIR (near infrared) technology. The innovative PET flake sorting sensor solution is equipped with the unique combination of RGB cameras and NIR sensors. Both extremely effective systems optimise flake sorting applications and minimise downtime. Erema’s new bottle-to-bottle Vacunite process (Stand D29) produces food-contact-grade rPET pellets with efficient decontamination, a compact design and low energy consumption. 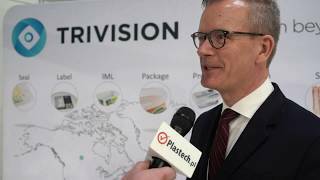 The process brings together its Vacurema bottle-to-bottle process with the newly patented, vacuum-supported solid state polycondensation (SSP) from Polymetrix. All thermal processing takes place in nitrogen or a vacuum, largely eliminating flake and pellet discoloration and removing additives. On Stand D2 FIMIC will profile its new ERA screen changer melt filter for plastics recycling. This new family of automatic filter changer has a double filtering and double scraping system. Equipped with two internal filtration chambers and two independent discharge valves, ERA enables a coarser filtration first, then a finer laser screen one. Advantages include the ability to run filtration for several days consecutively, reduced mesh changes and downtime with increased extruder productivity. The UK’s leading recycler of rigid plastics RPC bpi PLASgran will feature prominently on the stand of RPC bpi recycled products (E30) after it recently acquired the company. Also, on show will be samples of Sustane - an innovative new 100% recycled polymer to replace virgin polymer, the Plaswood edge bench and X-EnviroShrink - a new shrink wrap flat film technology from RPC bpi protec that contains Sustane. 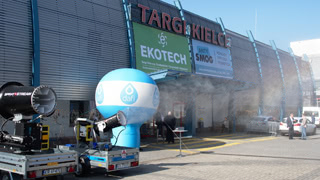 Visitors to Stand D1 will see Ettlinger’s ERF melt filter family of high-performance filtration solutions capable of handling high degrees of contamination. These are specially designed for processing polyolefins and polystyrenes, TPE and TPU with levels of contamination of up to 18%. Typical applications include reprocessing post-consumer plastics scrap such as LDPE packaging films, HDPE bottle flakes, PS- aluminium composites, for example from yogurt pots or cream chargers, automotive recycling and the recycling of refrigerator and electronics scrap. On Stand C37 Bühler will demonstrate how recyclers and packaging processors can utilise optical sorting systems to produce recycled material that is close to virgin quality. They will be detailing solutions to enhance purity, enabling the use of 80 to 100% recycled material with only 20 to 0% of virgin material rather than 75 to 80%. For the first time five Veolia plastics recycling companies will jointly present their capabilities and products on Stand B7: Multiport GmbH: HDPE Compounds for extrusion applications; MultiPet GmbH: PET Flakes for fibres, bottles, films and packaging; Veolia Polymers NL B.V.: PP Compounds for different applications; Veolia Recycling Plastics Sweden: LDPE, HDPE, PP recyclates and Plastiques de Mitry Grandjouan: PP, PE, PS ABS, PC recyclates. 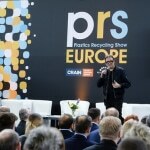 Among many companies exhibiting at PRS Europe for the first time are: Ampacet, Bollegraaf Recycling Solutions, Custom Polymers, Gianeco, HydroDyn Systems, Novek LLC, Plasper, Polytential, SIPA, Sky Plastic and Sogapol. Ampacet’s latest sustainable masterbatch solutions: the new REC-NIR-BLACK range, the Odor Scavenger 1000258-E, the additive masterbatch Blue Edge 78 (7600078-E), the sustainable Black masterbatch REC-O-BLACK 216 and Ampacet Biorange will all be on show on Stand F9. Sky Plastic transforms plastic waste into high quality products for a wide variety of market sectors including gardening and furniture, interior and exterior automotive parts and electrical appliances. Visitors to Stand A5 can discover more about its latest ranges of recycled polymers for all these applications. Featuring on Stand A27 HydroDyn Systems’ HydroCleaner containerised washing solution for plastic wastes is especially designed for highly polluted inputs such as post-consumer LDPE film, PET bottles or PP rigids. HydroCleaner applies precise friction to remove glue and other contaminants without needing additional chemical agents. Virtual Chemist from Polytential easy to use quality analysis tool that performs automated analyses on samples of plastic flakes will be on display at Stand A11. It uses hyperspectral technology and artificial intelligence to achieve the highest classification accuracy available on the market. This facilitates high quality recycling and enables data-driven plastic recycling. On Stand F21, SIPA’s newly launched Xtreme Renew is the world's first integrated system for the production of preforms containing 100% of recycled PET, but with the same quality as preforms made from virgin PET. Xtreme Renew combines two successful innovations - Erema's Vacurema and XTREME from SIPA. Compared with alternative systems for recycling old PET bottles back into new ones, it uses less energy, creates less CO2, and costs less to run. Kestutis Sadauskas, Director Circular Economy and Green Growth DG Environment at the European Commission will formally open the tow-day PRS Europe conference on 10 April. Speakers include representatives from major brands including IKEA, HP, Philips and Procter & Gamble.